Dinner with drinks (just 2) with my good friend/coworker John is fun, but the day after, not so much…mornings were so much easier to navigate while I was in my twenties. Also, it’s about to rain anytime now. Eck. I need some comfort food. I first noticed MarsalaWala’s yesterday while I was introducing Crystal to Falchi’s. Indian food is always promising. Today, after nixing the Korean bowl place, I went to MasalaWala’s and ordered 1 meat (Chicken Tika Masala) and 1 vegetable (Aloo Gobi = Cauliflower & potatoes) meal, which also includes 1 samosa and some nan bread. All this for $12 + tax. Spices aside (turmeric and curry is supposed to be good for your health, I hear), the entrees were just okay. The food was not terrible; the temperature warm, the jasmine rice was prepared nicely, and the vegetables were cooked properly. However, the nan was awful, and the chicken and samosas were not special at all. The best part of lunch was that my co-worker Kellie joined me at my table in the break room. We talked about our weekend plans. 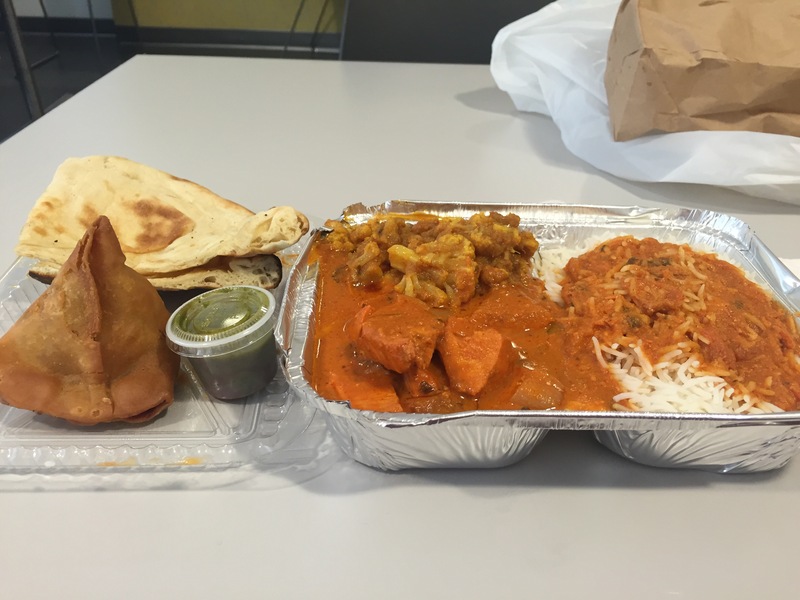 Then, she mentioned some other Indian place, Raj, near Queensboro Plaza, where the food is “insanely good”. Humm…something to think about, as I try to muddle through the rest of the day.